This is just a short post in which I want to share with you a funny but informative picture about the alphabets and how they can are taught in our digital era. Technology and especially mobile tech is crawling into every facet of our life. Our students and learners are extensively using and depending on it to do their everyday chores. Nobody ever imagined this huge shift towards the digitisation of life.In education, this change is starkly felt for old and traditional methods are expired and now there are new philosophies and pedagogies that live up to the 21st century version of education . 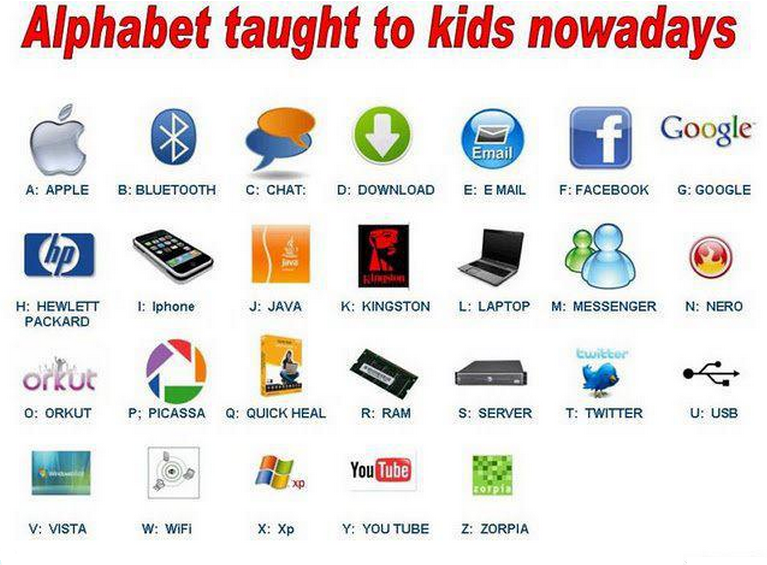 Among these innovations is the new way of teaching English alphabets. Have a look at the picture below to see the digitised sample of alphabets. This picture has been shared by one of my colleagues on Facebook so it is not my own creation.